These days we have more digital media than ever before and most people neglect to back up their data, while others simply backup on an external hard drive lacking redundancy. We know the problem with having no backup plan whatsoever, but having only an external hard drive can be just as bad. Keep in mind if there is a drive failure you won't just lose a few word documents and spreadsheets like years past. Our entire lives are stored on our computers, from priceless photos, video of the kids on Christmas morning, and financial documents. Let's not forget the tons of applications and music in your media library. Apple has built in a fantastic program into their operating system called Time Machine that will back up your data at preset time intervals. This helps with never forgetting to backup, yet does nothing to protect against multiple hard drive failures and provides no redundancy. If you're technologically savvy you can set up a RAID (Redundant Array of Independent Drives) system, of course you would need to figure out what RAID level you prefer. You then have the issue of the disadvantages of RAID, lock-in of RAID levels for the lifecycle of the data and the forced tradeoff between simplicity versus safety and stability versus expandability. So what are users to do? Enter the Drobo storage unit, which comes in many different models, but the important piece of this puzzle is their BeyondRaid technology. 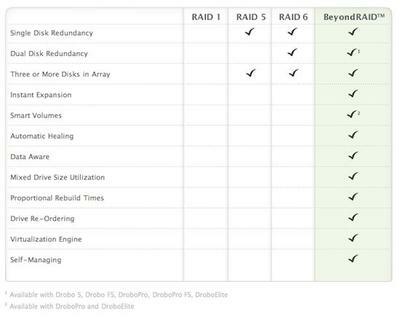 BeyondRaid implements the benefits of traditional RAID systems, but eliminates many of the limitations. The Drobo system will survive multiple drive failures (only RAID six has this capability assuming you have four drives), still rebuild your data and, probably the most beautiful benefit, is you can use any size drive with the Drobo while utilizing all available disk space. Below is a chart outlining the benefits of BeyondRAID as opposed to various RAID levels. Setup can't be easier on the Drobo: Simply install the dashboard software, format the disks to your preferred file system (NTFS, EXT3, HFS+ or FAT32) and if desired, set partitions. You can start with as few as two 3.5" SATA hard drives of any size, then add capacity as you need it. 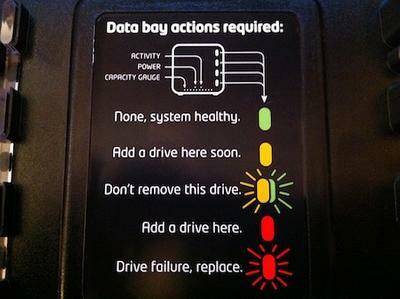 All the instructions you need are on the inside of the front cover- a green light next to the hard drive bay means the system is healthy, yellow means you need to add a drive soon, as capacity is filling up, alternating yellow and green flashing means don't remove the drive, red means add a drive, and flashing red signifies drive failure (all shown in the image below). The ten blue lights along the bottom indicate capacity, four lights represents 40 percent full and so on. When more capacity is needed, simply remove the smallest drive, insert a larger one and Drobo will rebuild all your data onto the new drive. I started with two 1TB hard drives with a 250GB partition to house my Time Machine backup. When I needed more space I simply inserted a 1.5TB drive into an open slot and I was ready to roll again. So far I have restored one Mac completely from my Time Machine which was stored on the Drobo and it went flawlessly. Now these units aren't cheap as the base model is a four bay unit with either USB or Firewire 800 connectivity and retails on the Drobo website for $399 (drives not included). 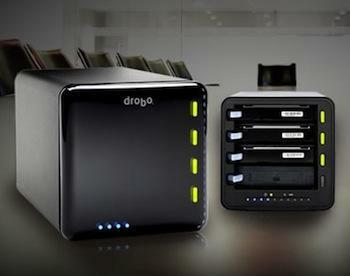 There are other Drobo models to choose from depending on bay requirements and your file sharing needs. Drobo FS is a five-bay storage array designed to deliver the best file sharing experience for connected home and home office use for $699. 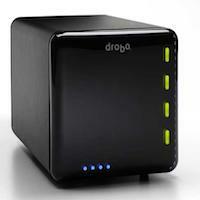 Drobo S is a five-drive storage array that features a triple interface (Firewire 800, USB 3.0 and eSATA connections) and single- or dual-drive redundancy, making it ideal for creative professionals and small business storage needs for $799. There are also three, eight bay models available for small business use that go beyond the realm of this review. In conclusion, the Drobo has solved problems I have had for the past few years. First, I continually needed to purchase external hard drives as high definition video consumes a lot of space, and second, I had no redundant backup of any of my data. If I experienced a hard drive failure I was pretty much out of luck, and my data was gone. I look forward to the additional expandability as I'm sure I will need additional hard drives in the future.